She becomes a nahual, able to transform herself into a tree, a coyote, into another person. She learns to transform the small “I” into the total Self. Judith Butler argues that “identifications are multiple and contestatory” which is a statement that both Gloria Anzaldúa and Audre Lorde discuss considerably within their poetry and theory. In fact, Anzaldúa and Lorde’s texts focus almost entirely on questions of identity. For both authors, anger and hatred begin as an external emotional reaction from other individuals which is then internalized for a marginalized body. This common act of internalization is discussed as a primary element that shapes identity. According to these authors, marginal bodies become silenced and invisible through their fragmentation by a masking of difference or/and the white washing of history/myth. Both authors recognize several ways for a marginalized body to be seen by those who would try to make such a body invisible and silent through their writings. Not only does the mythic norm help create marginalized bodies, but it is one of the starting points for those individuals who do not reflect it to begin self-fragmentation. This succeeds in creating a self-induced silence that many individuals do not even recognize, which mirrors the silence that other members of society place on a marginalized body. Like Lorde’s idea of the mythic norm, Anzaldúa’s mestiza has several versions of reality/norms which are contradictory and with which an individual within that culture is suppose to identify. To identify exactly with any one of them would be next to impossible for an individual enmeshed in more than one culture. Definition of self brought by self-design (and not those preordained by specific parts of our cultures) that is inclusive of all the elements of an individual is one way to resist fragmentation. 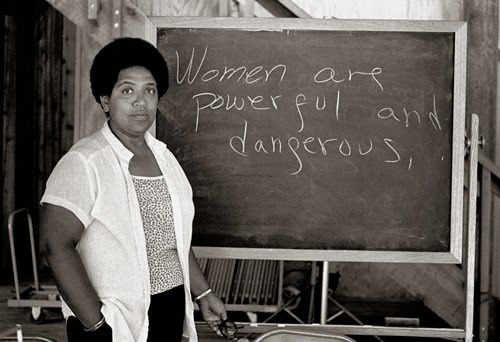 Anzaldúa and Lorde are resignifying the words that identify them–Anzaldúa by claiming the “new mestiza” as her identity and Lorde through her insistence that identifying as a “Black lesbian feminist socialist mother of two” is more inclusive. In Bodies that Matter, Butler states that “Neither power nor discourse are rendered anew at every moment; they are not as weightless as the uptopics of radical resignification might imply.” Yes, power and discourse are not weightless, but they are subject to change over time. Besides this, the immediate goal of resignification is not to change the discourse of a society as much as it is to give those living as marginal bodies a way to reflect themselves in a positive light to (and amongst) themselves. Resignification becomes a way to use what in the current discourse of the mythic norm would be considered a “derogatory term” in a personally powerful way by someone within a marginalized body. The personal positive use of these terms often lead to their eventual change in connotation amongst the larger cultural discourse as well—a byproduct of the act of the resignification. The countless examples of former “derogatory” slang terms that are now utilized as neutral (even academic) terminology attest to the larger impact resignification has been proven to create. The fact that both Anzaldúa and Lorde’s texts have been so highly influential since their publication speaks to the fact that their call for resignification hit a chord amongst readers. Both Anzaldúa and Lorde are poets who pepper their theory/prose with poetry, identified as queer and talk of the difficulties this created in their interactions with the homophobic society under which they lived, and use the straightforward language style most often associated with non-academics. The similarities show that these two authors are expressing the same concerns in many of the same ways in their work. One of the main differences between their theories on identity comes with Anzaldúa’s emphasis on identity’s connections to language and finding your identity through geopolitical space. In “How to Tame a Wild Tongue,” Anzaldúa states “Ethnic identity is twin skin to linguistic identity” and that “if you really want to hurt” someone “talk badly” about their language, (59). By making a person’s language(s) illegitimate, you are making their ethnicity illegitimate as well. Anzaldúa enacts this theory within some of her poems, most notably in “We Call Them Greasers.” The persona within the poem, an English speaking male (most likely white), uses the Spanish terms “ranchos” and “mañana” in a contemptible, insulting way to the people he is trying to swindle out of land. Also, since within his actions in the poem we are assured he thinks of these women and men as less than human and his laughter at the fact they did not understand/speak English, we can infer he sees their language as illegitimate. In fact, in stanza three we see an actual event that shows that the language these people speak is seen as illegitimate. who claimed we were the intruders. and appealed to the courts. them not even knowing English. Even with proper documentation, because their language was not seen as legitimate, these “troublemakers” lost their land to the persona. 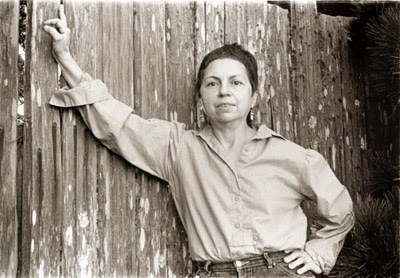 Like the unfortunate “greasers” in the poem, anyone who does not comply by speaking and understanding the cultural norms of the un-marginalized are “troublemakers.” Anzaldúa’s focus on language and place in regards to identity makes perfect sense to her readers that experience the reality of living in two or more languages/cultures. Written from a code-switching troublemaker to speak candidly to other code-switching troublemakers, La Frontera legitimizes personal experience with language in a similar way to Gertrude Stein. The major difference is the political ramifications of both Lorde’s and Anzaldúa’s work are much more overt. Shauna Osborn is a Comanche/German mestiza who works as an instructor, wordsmith, and community organizer in Albuquerque, New Mexico. In 2013, she received the Luminaire Award for Best Poetry from Alternating Current Press, a National Poetry Award from the New York Public Library and the Native Writer Award from Taos Summer Writers’ Conference. You can find her online at shaunamosborn.wordpress.com.